Writing Letters helps kids ages 3-6 with alphabet identification and practice through letter-tracing prompts, Hidden Pictures(R) puzzles, matching, and more, all in a travel-friendly activity pad format. Identifying letters is an important step toward reading readiness, and Highlights(TM) infuses Fun with a Purpose(R) into this essential learning activity. 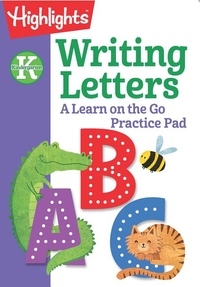 With vibrant art and engaging prompts, Highlights(TM) Learn on the Go Practice Pads expose kids to letters through writing practice and fun puzzles and other activities. That's Silly! (TM) and Hidden Pictures(R) puzzles are among the activities that will engage and entertain kids and build their confidence as they practice essential vocabulary skills, including identifying and writing letters.